American Tank Company’s galvanized steel corrugated water tanks are used for a variety of applications such as drinking water, fire protection, irrigation, municipalities, and wastewater treatment. 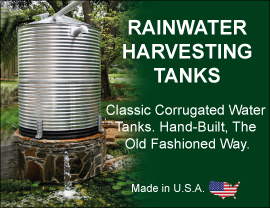 Based on this century old, time-tested concept in tank design and construction, galvanized steel corrugated water tanks provide watertight, durable, quality storage tanks. Call toll free today: 1-877-655-1100 to speak to one of our friendly and knowledgeable Steel Tank Specialists. The factory applied Interior coatings permanently adhere to the steel. NSF & FDA certified coatings are available for potable water storage applications. Custom colors available for an additional charge. American Tank Company’s galvanized steel water tanks may require anchoring to an adequate concrete pad depending on job size, location and local code specifications. American Tank Company’s galvanized water tanks are backed by a one year manufacturer’s warranty against material or workmanship defects. FRB = Farbertite, a non-potable water interior coating. NSF = ANSI/NSF 61 approved interior coating for potable water.